Engineering Assistants JULIE LAST, BILL JENKINS, MIKE ROSS, ROBIN LANE, DAVE STALLBAUMER, CHRIS FUHRMAN, ANGUS DAVIDSON, FRED HOWARD, RICHARD COTTRELL, RICK O’NEIL, JOHN PAYNE. Copyright renewed. Assigned to Elvis Presley Music and Unichappell Music, Inc. (Rightsong Music, Publisher). All rights for the world controlled by Unichappell Music, Inc. International Copyright secured. All rights reserved. Revised lyrics copyright ©1988 by Elvis Presley Music and Unichappell Music, Inc.
Thomas Dolby appears courtesy of EMI-Manhatten Records, a Division of Capitol Records, Inc.
Tom Petty appears courtesy of MCA Records, Inc.
Steve Stevens appears courtesy of Warner Bros. Records Inc.
Special thanks to Bob Bradshawe, Andy Brauer Doug Buttleman and Yamaha International, Lon Cohen, Manny Elias, Peter Gabriel, William Greider, Amanda Harcourt, Federico Jimenez, Juan Jimenez, Julie Last, Thom Moore, Paul and the gang at Ground Control, Hilary Prusser, Walter Rice, Patsy Smith, Dave Stallbaumer, Dave Taraskevics, Fred Walecki. I remember when I first heard this album in '88. After almost a decade of awful 80's big hair and cheap pop on the radio this album was a relief and refreshing return to quality music. My Secret Place is one of my favorite duets. Being a Peter Gabriel fan and a Ladies of the Canyon fan I was in heaven. After almost 20 years I still don't know what my favorite song is on this album. The arrangement is such that it just flows from one song to the next. I recently pulled this cd off the shelf after several years and again I just love, love, love every note. 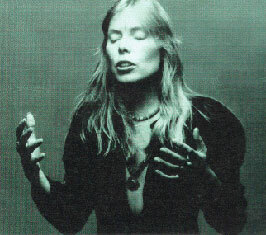 This world is truly a better place with Joni Mitchell in it. That's so interesting Stimpy, thanks for letting us know! The most Joni has said about this song is that it was based on a conversation she had in her early years as a singer, after she'd played to an audience of GIs and one of them came up to her and said something like 'You've got some cheek to stand up there and sing about love', and went on to tell her his story. But obviously she's drawn inspiration from that film - it can't be a coincidence. In any case many of her songs are cinematic, in their style of story-telling, and also sometimes based on films (Hana, and Night of the Iguana in her last album, for example). 'Chalkmark' has never been a favourite album of mine, but it has some powerful songs. One of the best I now think, is Lakota - having heard a pared down version (Joni on guitar with Larry Klein on bass, at the San Remo festival, Italy) - incredibly soulful and powerful. Most of that power was lost on the album, in my opinion, through overproduction. Anyway, must look up The Looking-Glass War. Thanks! Just a quick comment on "The Beat of Black Wings," which I think is the best track on the record. This song is actually about (watching) the film version of John Le Carre's "The Lokking Glass War," which was made in 1969 in England and features a young Anthony Hopkins in a supporting role. The film is, in fact, about a "young soldier," (played by Christopher Jones) who is (forcibly) recruited by the British Secret Service to infiltrate East germany during the Cold war and photograph a missile site. About 45 minutes into the film there is scene where Leiser (the soldier) breaks out of the training school visits his girl friend/fiance who tells him, after he literally "put's his hand on her belly" to feel his unborn son, that she has ended the pregnancy without telling him. He becomes violent and storms out,with Anthony Hopkins in tow, to go get blind drunk in a pub in London. Many drinks later, he tries to start up a conversation with 2 "mod" girls in the bar seated at a nearby table. Blowing him off, one of the girls asks him for his zodiak sign, and then tells him, dismisssively, that she "sees black wings beating all around him." He and Hopkins leave the pub into a rainstorm, where Leiser its on the curb next to a bohemian street artist who is drawing pictures (you guessed it) "on the sidewalk with chalk." Too much to be a coincidence IMO. Rent it from Netflix and check it out for yourself. Its not a bad film either, BTW.